I finally tracked down the “Episode 0” fansub of Kino, named “The Tower Country”, on YouTube (after unsuccessfully looking on BitTorrent). The episode is about 12 minutes long and broken into two pieces. It was a fascinating episode, much more faithful to the original series than the “Life Goes On” prequel. I feel like Kino is an addiction of sorts – like Zen koans, they don’t ultimately have any meaning or lesson you can consciously absorb, but seem laden with symbolism nevertheless, and I find myself wanting more. Ask and ye shall receive… there will actually be a new Kino series released in 2007, featuring Kino as a young woman. The title will be “Kino No Tabi: Nanika Wosurutameni” (or, “In order to do what?”). There’s more info about the new Kino series here and at the official site here but it will take a Japanese-speaking otaku to decipher. 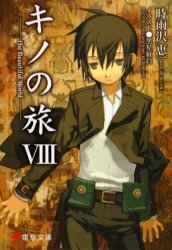 One thing is clear though – the manga covers upon which the new series is based demonstrate that Kino won’t be mistaken for a male anymore. And if the google translate of the official site say anything, well, after you get through the hilariously bad translation… it does seem to suggest that it is a movie in the works. Probably animated movie, but still sounds like good news! Whoops, I guess image tags aren’t allowed (or I screwed something up when entering it). Here’s the scan of the front cover of the English release of “Kino no Tabi: Book one of the BEAUTIFUL WORLD”. I have the torrtent, and it’s still seeded. All I need is your email (it’s a 15K attachment, the actual 00 episode is 91MB). Nick, thanks for that. I might see if teh books are available at the library or put in a request for them. Not really keen to spend money on them 🙂 FYI I fixed your link and deleted the redundant comment. if it is possible, could either conrad or fledgeling otaku send the torrent to my mail (shokobutsu at yahoo dot com) if you guys still have the torrent?